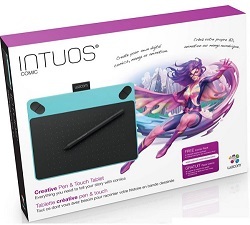 If you want your characters to fly off the page, Intuos Comic is your perfect sidekick. Sketch, ink, and color frame after frame, and bring your story to life. It’s never been easier to make your comics and manga pop. This Tablet also includes Clip Studio Paint Pro. Smith Micro Clip Studio Paint Pro is the digital download version of Manga Studio 5 is your all-in-one solution for stunning, ready-to-publish manga and comics. Quickly and easily create manga and comics with Manga Studio's drawing tools, filters and special effects. Get started immediately with the intuitive user interface. Draw naturally with a Pen Tablet and Invigorate your artwork using the integrated color features. Express motion and moods with speed lines and focus lines while adding dialog with built-in word balloons. Choose from tons of screen tones and add dimension to your drawings.Clip Studio Paint Pro helps you create professional manga and comics from start to finish! It also includes Anime Studio. Bring your imagination to life! Anime Studio is your complete animation program for creating 2D movies, cartoons, anime and cut out animations. Create your own desktop animated shorts in the style of South Park Studios, Nickelodeon Animation Studios, Cartoon Network Studios, Disney Animation Studios or use it to produce animations for film, video, commercials or streaming over the web. Anime Studio has everything you need to make amazing, professional animations. BONUS! Get a FREE! ($49.99 Value) iClipArt.com 1-Year Subscription. iCLIPART.com contains over 3.5-million royalty-free clipart images, photos, web graphics, animations, fonts and sounds. Subscribe today and receive access to this amazing collection! Every iCLIPART.com subscription includes professional-grade imagery in formats compatible with virtually all Macintosh and Windows compatible software. Just choose the format you need and click download. It's that easy! Setup is simple. Just plug a single USB into your Mac or PC. Install the driver, then register and download your creative software. And you’re ready to start creating. Explore an impressive sensory selection of realistic Natural-Media that perfectly emulates real life art materials. Experience industry-standard CAD features, precise 2D drafting and 3D design tools. Lets you connect your tablet to your computer without wires.